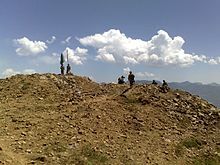 As early as 2007, the northern region had been suffering with an insurgency and President Musharraf was increasingly under great pressure from the militants when several army operations outlined mixed results. In March, his government was forced[by whom?] to sign a peace treaty with Fakir Mohamad, the main militant leader in Bajaur. 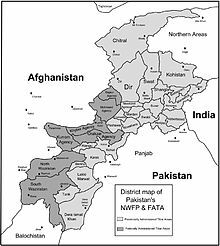 Militant groups then held three districts in the Federally Administered Tribal Areas: South Waziristan, North Waziristan and Bajaur Agency. The US Ambassador Cameron Munter found it difficult to counter the Anti-American sentiment in the country, especially after the Raymond Davis incident.[relevant? – discuss] The Anti-Americanism sentiment in Pakistan is one of the strongest in the world. The Anti-Americanism has risen as a result of U.S. military drone strikes introduced by President George W. Bush and continued by President Barack Obama as his counter-terrorism policy.[relevant? 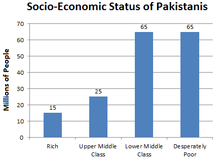 – discuss] As of present, almost 60%–80% of Pakistanis consider the United States as an enemy combatant state.[relevant? 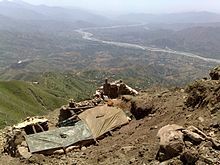 – discuss] The Anti-Americanism has been provoked mainly as a reaction from those who are critical of American CIA activities in Pakistan, such as the infamous break-out of the Raymond Allen Davis incident and American intrusions from Afghanistan border such as the 2011 NATO attack in Pakistan. The credibility of Obama administration was undermined in the country[when?] and, furthermore, approximately 4 in 10 Pakistanis believe that U.S. military and economic aid is having a negative impact on their country; only 1 in 10 believes the impact has been positive. In 2010, Pakistan purchased 1,000 laser-guided bomb kits and 18 F-16 fighter jets from the US. 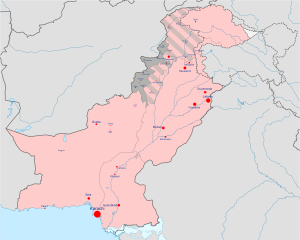 Wikimedia Commons has media related to War in North-West Pakistan.